A thrush treatment so powerful that it lasts for up to eight days without a reapplication, even in wet and muddy terrain. 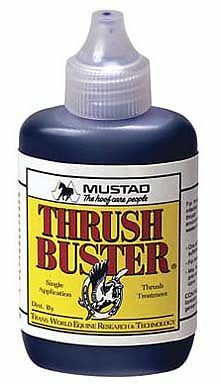 A single application relieves the agonizing, crippling effects of thrush and dramatically reduces the chances of reinfection by creating an antiseptic barrier between healthy tissue and thrush. Unique purple color tells you where it is doing the job. Apply a fresh coat only where the color has faded. Can also be used before applying sole pads and silicon to toughen thin soled feet and reduce bacteria counts.